Muslim police are being prevented from playing a part in fighting terrorism, a senior Muslim officer has pointed out. Supt Dal Babu was speaking at the first annual conference of the National Association of Muslim Police Officers. 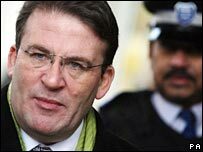 Only a few Muslim officers work in counter-terrorism, he told his audience, who included Home Office minister Tony McNulty. Several chief constables also attended the conference at the Police Training College in Ryton, Warwickshire. Supt Babu added: "The NAMP believes the current vetting system is putting obstacles in the way of recruiting and promotion of BME (black minority ethnic) officers. "This may result in low morale and the feeling of obstacles to promotion; furthermore it's likely to impact on the operational ability of the police service and its capabilities within counter-terrorism operations." About 300 delegates listened to Mr Babu, the association president, and other speakers including the Metropolitan commissioner Sir Ian Blair and the West Midlands chief constable Sir Paul Scott-Lee. How can we play our part if we're stopped from joining important units? The Police Minister Tony McNulty told the audience he agreed with the Superintendent's comments. Afterwards, he told the BBC he promised to look at the vetting procedures. "The overall process is slower that we would like. We will look at it but security is paramount and if there are ways in which we can reform the vetting process, without challenge to security then that's what needs to prevail." The minister said it was important that more Muslim officers joined counter-terrorism units and he knew the police service was aware of this. One delegate who did not want to be named said that Mr Babu's words go to the heart of the debate among Muslims in a post 7/7 world. "How can we play our part if we're stopped from joining important units?" Supt Babu said there are only a handful of Muslim officers in counter-terrorism. He now wants more so that, by reaching out to Muslim communities, hearts and minds can be won to counteract the alienation being felt by them. Can the police ever say 'not for me'?